Apple has passed the one billion mark in sales of the iPhone. The iPhone first arrived in Apple Stores in June 2007. There were long lines on the launch day with reports of people even selling their spaces in line for hundreds of dollars. The iPhone has gone through multiple iterations since the 2007 launch with progressive models becoming lighter, thinner, faster and more powerful. The next model, the iPhone 7, is expected to be available for pre-orders starting September 9th according to Forbes. 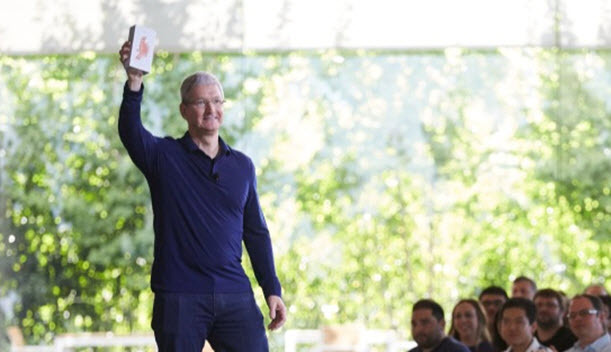 Apple CEO Tim Cook (pictured above) made the announcement about the 1 billionth iPhone sale at an employee meeting in Cupertino on the morning of July 27, 2016. He can be seen holding the device over his head. Tim Cook said, "iPhone has become one of the most important, world-changing and successful products in history. It's become more than a constant companion. iPhone is truly an essential part of our daily life and enables much of what we do throughout the day. Last week we passed another major milestone when we sold the billionth iPhone. We never set out to make the most, but we've always set out to make the best products that make a difference. Thank you to everyone at Apple for helping change the world every day."